In the face of two additional emails surfacing since the last Helena-West Helena City Council meeting, Alderman Joe St. Columbia remains defiant about the racist emails he has forwarded to numerous people in the community. 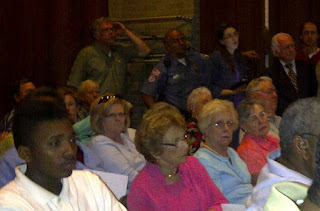 Without the sufficient 2/3 of the vote to override Mayor Willis's veto of a censure of St. Columbia for the first email that said Helena-West Helena officials were "monkeys" running the zoo, Alderman Marvin Jarrett passed out to the largely elderly, white crown out in support of St. Columbia the two emails that had surfaced since the last meeting. One has been dubbed "the black welfare queen" email. It has a picture of a single black mother and her children with a caption that says, "They sure know how to game the system." The other says, "In Honor of Black History Month" and depicts two thuggish looking black males with no shirt, unkept hair, sagging pants, and gestures resembling gang signs while saying, "It's not our fault we can't get jobs, it's the white man holding us back." St. Columbia defiantly told the City Council that "he is not a racist. I have black friends." He went on to say to Jarrett, "I am not going to discuss this every meeting. I have said all I am going to say about this." St. Columbia made it clear that he intends to remain in office and refuses to apologize. Mayor Willis has said he shouldn't apologize and has called St. Columbia, "one of the most respected leaders in this community." Ward 2 resident Leslie Galloway has been trumpeting St. Columbia's virtues online and urged people to come to the meeting and support him. She has called those opposing St. Columbia "idiots" in some of her online postings. After the meeting, a contingent of white supporters of St. Columbia, led by former West Helena Alderman Walter Morris, Sr. (the founder of H and M Lumber Company) surrounded St. Columbia with smiles and pats on the back as they left the meeting. It appeared that even in the face of the two additional emails, St. Columbia's support from white voters remained strong. Leslie, in America, people have the right to speak their minds. You have your thoughts and opinions. I have mine. Included in the right to free speech is the right to be wrong when the speech is made. You are wrong and someday you will realize it. I am overjoyed that you have reduced yourself to name calling. I knew, all along, the kind of person you were and are. James, I have been a social work in Helena for the past 16 years. Most people who know me well, know I am here to do good. My mother has taught school for 37 years, my father practiced law here for 40 (may he rest in peace) and served as public defender for many years. My sister has been a pharmacist here for the past 15 as well. My family, the GALLOWAYS, have always served this community. Even my grandfather, Captain Dwight Galloway, served on city council as well. You can write or say whatever you want but it would be nice if you would print factual and truthful information. All you are doing is hurting this community by printing gossip. You are trying to divide people instead of bring them together. Some of the people you gossip about are good citizens of this community who spend a lot of time and money to make it better. Leslie, I have not printed one bit of gossip here. I don't need to hear about your mother, father or sister. My comment was not to them or about them. They are who they are PERIOD. I don't bring others into a dialogue unnecessarily. I have said nothing about the GALLOWAYS. Plus, what you have printed adds nothing to the discussion anyway. YOU ARE WHO YOU ARE AND WHO I HAVE ALWAYS THOUGHT YOU WERE. You can brag on yourself until you turn blue in the face, your bragging will not add to or take away from the truth. Just be real and recognize the facts. You are who you ARE. PERIOD. If you call that GOSSIP, then so be it. I call it the unadulterated truth; more like the GOSPEL!! !